Register for a camp at the USTA Billie Jean King National Tennis Center. 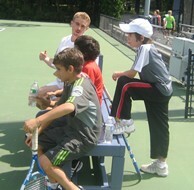 For more information, visit www.ntc.usta.com or call 718-760-6200. Group instruction starting this April for youngsters between the ages of 6 – 18 years at all levels of play. These camps introduce tennis to young children with fun-filled on-court activities in the QuickStart Format –fitting tennis to kids based on age and physical size. Our outdoor Junior Tennis Camps provide group instruction to youngsters between the ages of 10-17 at all levels of play. Areas of emphasis include: Technique, Tactics and Strategy, Fitness and most of all - FUN. Continuing this year will be the addition of cross training as we introduce campers to soccer, softball, and other sports that will enhance the learning and camp experience. Permission slips will be provided to those interested in participating in our trips to the Flushing Meadows Park pool and other park venues. These outdoor camps are designed to enhance the development of Top Ranked Junior Players with NTC Rating of 4.0-5.0. Enrollment is subject to approval by the USTA BJK National Tennis Center High Performance coaches.